February 25, 2014 is a voting day. 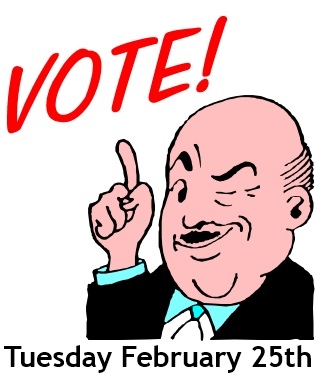 Remember, Tuesday is that special voting day where your local school districts count on snowbirds to be absent from the rolls so they can get millage requests passed. In Elk Rapids, its a bond that has failed a couple of times, and last time by only a few votes in the general election. (November) They figure it ought not be hard to get it through while many of the property owners are absent. Never mind the cost of a special election to taxpayers when nothing else is on the ballot. Around Michigan there are dozens of examples of this type of electoral abuse, so lets not make it a rewarding venture. Do a favor, and give your over taxed friends a call and reminder. Unless there is a really good reason, off cycle elections are generally made to “slip one by” the voters as a rule. Apparently elections will be held in 50 of Michigan's 83 counties. The PDF below will show you where. Byron Schools has an up to 3 mill sinking fund on the ballot. Mostly in Shiawassee County, but parts are in Conway, Cohoctah, and Deerfield Townships in Livingston County.